Prime Minister Narendra Modi returns to the Gujarat battlefield on Wednesday and will address rallies in Morbi and Prachi villages near Somnath, Palitana in Bhavnagar in Saurashtra region and at Navsari in south Gujarat after a day’s break during which he inaugurated the Global Entrepreneurship Summit and the Hyderabad Metro. Saurashtra, which will go to polls in the first phase along with south Gujarat on December 9, will witness a busy day as Congress vice-president Rahul Gandhi also returns to Gujarat for the eighth leg of the Navsarjan Gujarat Yatra and Hardik Patel, too, will hold a rally. The PM went on to attack the Congress on one rank one pension in the Army. “I want to ask the Congress. What is it that you have against our army? The demand for OROP was pending for forty long years. Why did successive Congress governments do nothing about that?”. The PM attacked the Congress for “neglecting” Gujarat. “When Indira Ben (Indira Gandhi) came to Morbi, I remember there was a photo of her in Chitralekha Magazine with a hanky over her nose due to the foul smells, but for Jansangh/RSS the streets of Morbi are fragrant,its the fragrance of humanity,” said PM Modi. ALSO READ | Will Prime Minister Narendra Modi's Attacks on Congress Help BJP in Gujarat? Prime Minister Narendra Modi, in all the four of his rallies, took pains to describe how the Congress was not just anti-Gujarat, but how Gujaratis - right from Sardar Vallabhbhai Patel to Morarji Desai - were not given their due by the Congress party. RECAP | In a veiled reference to Congress scion Rahul Gandhi, Modi had said that people come from outside and say all kinds of things to malign the image of the state, but it would only help the BJP retain power here. “I am grateful for all the 'kichad' being thrown at me. After all, a lotus blooms only in 'kichad' so, I don't mind if more is thrown at me,” he said to loud cheers. 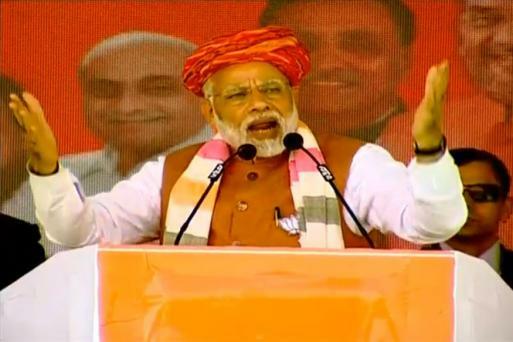 RECAP | PM Modi on Monday kick-started his campaign trail in poll-bound Gujarat and launched a stinging attack at the Congress, saying that the upcoming election will be a fight between trust on development and dynastic politics. Choosing to speak in Gujarati for the benefit of the local audience, he said that people of Gujarat would teach the Congress a lesson for making baseless allegations against him. PM Modi attacked Congress Vice-president Rahul Gandhi for his Gabbar Singh Tax remark on Goods and Sevices Tax (GST). “Those who have looted all their lives to remember only dacoits. I am here to give every penny back to the poor, which they looted all these years,” he said. Those who have looted the country can only think of dacoits: PM Modi on Rahul Gandhi labelling GST 'Gabbar Singh Tax'. Modi said water shortage was the major issue in Saurashtra but out government solved it by bringing the waters of the Narmada here. “For us, what matters is the well-being of people In good and bad times, the Jan Sangh and the BJP have stood with the people of Morbi. One cannot say the same about the Congress and their leaders,” he said. While the debate around OBCs may not have been as polarising as that around Patidars, their position as "kingmakers" will also hinge on their ability to unite in favour of one party. 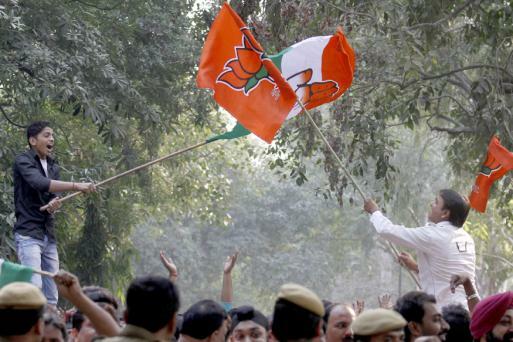 The polling for the two phase Gujarat Assembly elections will take place on December 9 and 14. The counting of votes will take place on December 18. PM Modi will hold four rallies on Wednesday, after a day's break during which he inaugurated the Global Entrepreneurship Summit and the Hyderabad Metro in the Telangana capital. Modi will address rallies in Morbi and Prachi villages near Somnath, Palitana in Bhavnagar and at Navsari in south Gujarat. PM Modi attacked the Congress during his rally in Gujarat and said that while the Congress relied on the hand pump model, the BJP delivered the Narmada model. Prime Minister Narendra Modi and Congress vice-president Rahul Gandhi will be back in battlefield Gujarat on Wednesday to power the electoral campaign of their respective parties in the bitterly-fought Assembly polls.